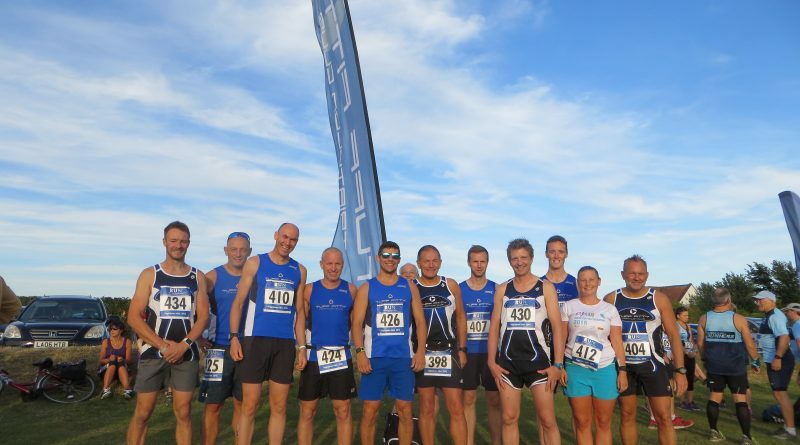 First club member home was Andy Crawford in 26 minutes (17th overall); 9 seconds behind was Tom Goddard & a further 12 seconds behind him was Simon Thistlewaite – very strong running from our ‘Tuff Top Trio’, all home in the top 23 out of 420 runners. James Oram (wearing green) was next. 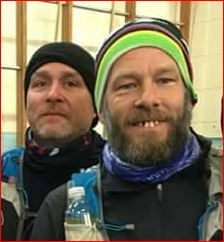 Good results from Pete Littleboy next Tuff, & Paul Martin. The next Tuff home was Phil Baker who, upon arrival, got a continuous amount of questions asking why the heck he had turned out! This was because just three days ago he completed his full distance Outlaw – and he was still wearing his number tattoos to prove it – seriously impressive Phil (and he still ran strongly). However the Tuff list didn’t end there as Jason Rae, Glenn Parisi, Michael Redgrave, Clive Harvey, Lucy Cardus & Chris Evans crossed the line. Elaine Rousseau completed our finishers who was wearing her running club vest. 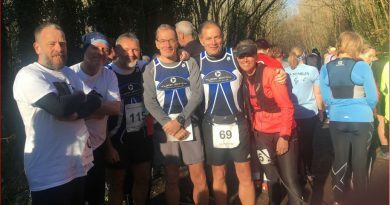 The Tuff contingent welcomed the vocal support of Bob Thomas who had ridden over and popped up all around the course shouting encouragement; Thanks Bob. A good Tuff turnout with a few interested runners coming over to chat about matters Tuff. The North Downs Way is a continuous trail run along the North Downs Way. Starting in Farnham in the Surrey Hills, the course crosses through Guildford and includes the steepest climb of the whole course – Box Hill. Then up Reigate Hill skirting the outer reaches of London before heading to Ashford in Kent. 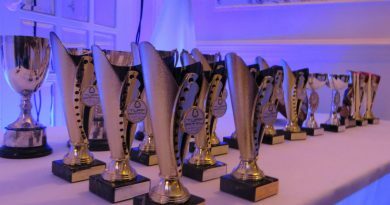 If runners decided to go the full distance to Ashford that would total, climbing of over 10,000 foot, and 100 mile distance. 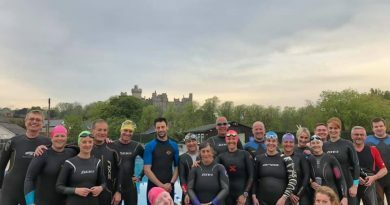 After prodding sausages on the Barbecue at Tuff’s Lido do last Sunday, Trevor left to drive down to Dorset, for the Swanage Bay Swim; part of Swanage Carnival and Regatta held on the Monday evening. Preparation was not too good, following many cheeky beers with the BBC sports presenter, Mike Bushell, (nice bloke), in a Corfe Castle Pub the night before. 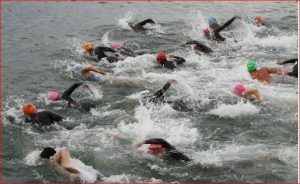 The swim consists of either a 100m or 250m swim for the kiddies, or a 500 and 1,000m swim for the big boys and girls. A low key event, turn up on the day, pay your money and swim with no official timing. 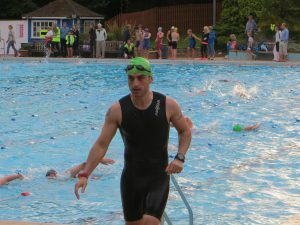 Some 40 + people took part in the 1,000 m swim, over a two lap course. Good conditions, and I emerged in the top 10, almost a minute quicker than last year, so to celebrate it was off to the Carnival real ale beer tent!! 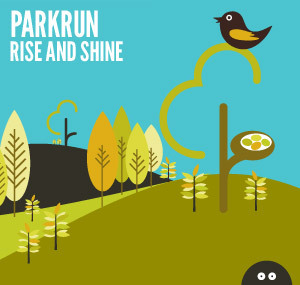 Maybe it is because of the holiday season, but lower numbers of Tuff’s participating at Park Run this week. At Worthing Park Run James Oram completed in 21:16, with Daisy Bashford, & Clare Worgan making up the Tuff Trio. 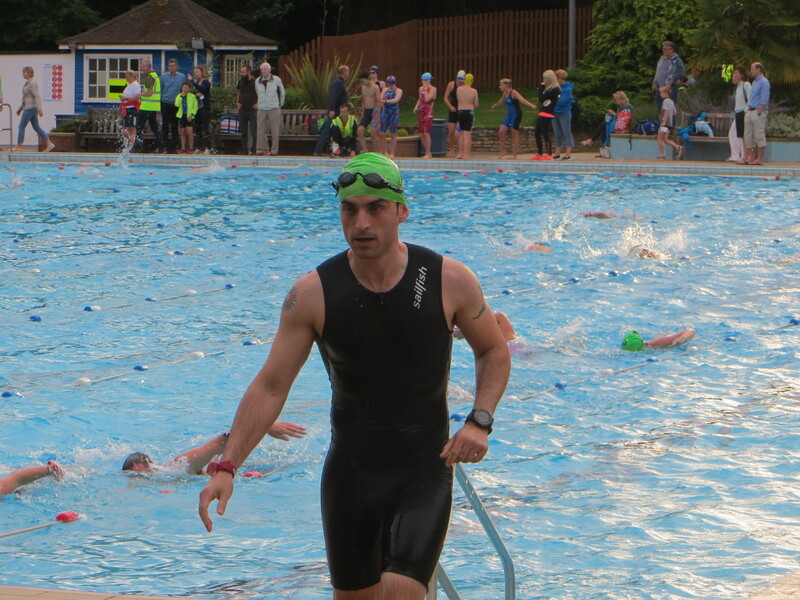 At Bognor Park Run Jason Rae was in action crossing in 23:32 ahead of his 70.3 tri the next day. 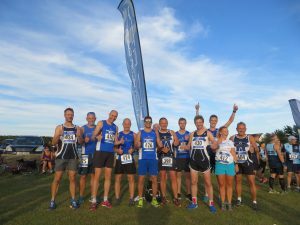 Up at Horsham Park Run Ian Moore stepped back from running and administered the timing.